Sharp points bite into wood quickly and easily. For use in exterior and interior applications. Rust resistant. Designed for home and industrial applications. Two hex nuts included. Standard machine screw threads. For interior and exterior applications. Manufactured from steel wire. 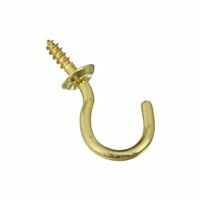 Heavy hook designed for marine and other outdoor projects. Can be opened and closed with pliers or vise. Non-magnetic. Manufactured from stainless steel. Designed for securing gates and doors on farm and utility buildings. Sharp points staples for easy and quick installation. For interior and exterior applications. Visual-pack. Designed for home and farm applications. Sharp screw point bites into wood. Rust resistant for use in exterior and interior applications. National Eye Bolt, 5/16 in Thread, 3-1/4 in Overall Length, Stainless Steel, Zinc Plated National Hardware Hook and Eye, Series: V2000, 6 in Length, Steel, Zinc Plated, BHMA A138.18, For Interior and Exterior Applications Heavy hook designed for marine and other outdoor projects. Can be opened and closed with pliers or vise. Non-magnetic. Manufactured from stainless steel. Sharp points bite into wood quickly and easily. For use in exterior and interior applications. Rust resistant. 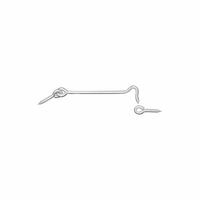 National Eye Bolt, 5/16 in Thread, 4 in Overall Length, Stainless Steel, Zinc Plated Medium weight to heavyweight eye bolt with lag screw threads is for industrial or home use. Heavy gauge steel rod. Long thread for extra holding power. Factory number denotes shank diameter x length. Strong, rust resistant body and steel eye bolts. Designed for tightening or drawing together various lines and cables. Ideal for marine and other outdoor applications. Designed for tightening or drawing together various lines and cables. Ideal for marine and other outdoor applications. Strong, rust resistant body with steel eye and hook bolts. Clear coated aluminum body.